And if you’re not a mom, you’ve been a witness to that crying, screaming temper tantrum. Emmy has thrown more temper tantrums in the grocery store than I can count. I’m often tempted to take her out and just leave, but I am usually there because we desperately need food in the house and it is my allotted time for shopping since Lily is in school. Leaving is not an option. Today, Emmy somehow spotted a make-up kit, geared for children, in the sale aisle. She decided she had to have it. I said no. On your mark, get set…TANTRUM! She walked next to me, screaming and crying while I tried to distract her. Hey, at least she was moving and not lying on the floor. “Do you want to pick out some cereal for Daddy?” NO!! “Here are some Goldfish. What kind do you want?” NO!! The kind lady working in the deli asked me if Emmy could have c-a-n-d-y, and I gratefully said yes. Emmy was finally distracted. In the produce section, she happily sat in the cart and twisted twist-ties around the produce bags. As I rounded the corner to grab a box of the pizza dough mix I almost forgot, I saw a dad looking at his smart phone. (email? grocery list?) The toddler in his cart grabbed at the floor display next to the cart, and in just an instant, two jars of pickles careened to the floor. And as Emmy remembered the forbidden makeup bag and started to whine again, I sighed with relief that at least I didn’t have a “picklepuss” (as the embarrassed dad jokingly started calling his toddler) in my cart. Do you have an e-reader? 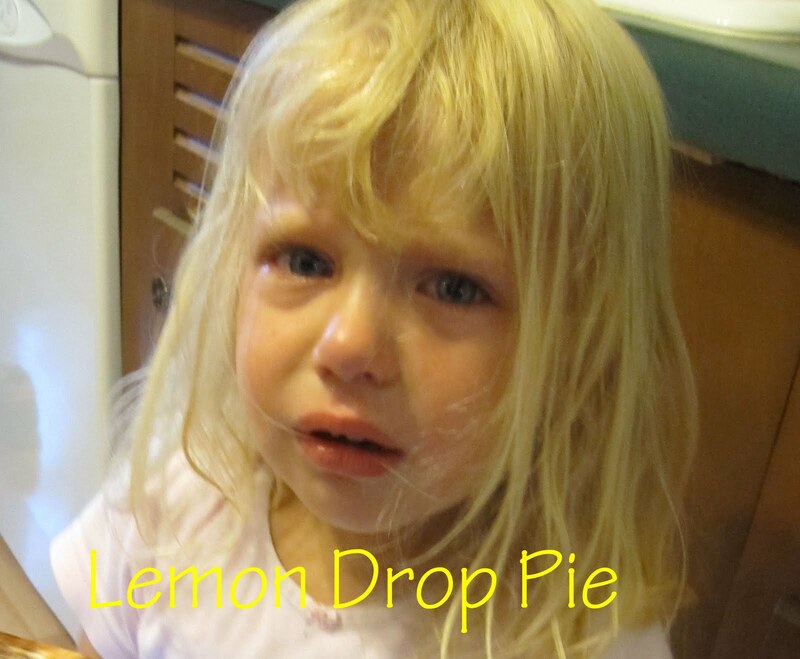 Join the conversation in the Lemon Drop Pie Community! I’d like to get one, but I’m having trouble decided between Kindle or Nook. Do you have one? What do you like/dislike about it? I don't remember my children ever doing something like that ;-). Perfect angels don't you know.As to the e-reader. I have a Sony now and am considering a Nook color. The problem I saw with the Kindle is the format of the books that it uses. My advice is to get one that will read PDF, EPUB, word documents, etc. One that will allow you to download a variety of formats. Why anyone would reward that kind of behavior with candy is beyond me. Oh man. I had a moment today. My boys were acting like Target was a playground and it was driving me nuts. They crashed into some lady's cart and she was sweet about. She said, "they don't get any better when they get older." I guess she has teenagers. I see children doing that all the time. You can't give in, you just have to let them cry.I believe I was like that when I was little and my parents gave in all the time. I am still that way if I don't get my way although I don't cry or lay on the floor. It's nice to know we're not alone! I am particularly annoyed by the crabby old people. I wish there were more like the nice lady who encouraged you. And, of course, the candy lady! Oh yeah. No way to win at those times. I'd resort to some kind of snack, too. These days I make sure to go while both are in school, which means I try to never enter a grocery store during the entire summer. Not easy. Yes…so been there. I would stop before we would go in and remind them that if they didn't obey I would march them back to the car, give them a pat on their bottom side, and then march back in to finish my shopping. My 2 year old made up a song at that time, "if you don't mind your mommy, you get a spanking and if you mind your mommy, you don't" and he would sing it before we would go in.Well it worked most of the time until they figured out I didn't have my spanking spoon…so they tried me out..so I brought them back out, got in the car and took off my sandel and patted their bottom…from then on they knew I meant business…now I am not saying to spank or not, I am just saying they all know how to try us…my boys would just kinda make a joke out of it even at an early age…they now all can go into singing the song. They will have kids of their own one day! !Hang in there and so glad a compassionate woman said that to you…I say the same thing when I see young mothers! I am glad to know it encouraged you!!! I'm so sorry. I am one of the fortunate ones that was able to leave the store for my son's tantrums…….it only happened 2x. It works, but only if you have the time of course. All I ever had to say after that was "do we need to leave the store?" It always helped me to set the rules before entering. If I didn't…he tended to head the wrong direction.But yes……it will pass. Good luck! Yep, totally been there….it will pass. When they turn twelve they just mope and give you "I hate my life" looks, when you won't buy them something. It is quieter, but no less annoying!